Back in the days before commercial grafting techniques and rooting hormones, all roses were propagated the old fashioned way - a decent sized shoot stuck in the ground! And while you should always get some sort of a result from this method (so long as you plant enough), a few tips in the right direction will get you growing roses from cuttings in next to no time. The best part of the rose to use for taking cutting from are stems which already have blooms on them. These can be from the early stages of just opening, to those which have already started to wilt or drop petals. These are know as 'softwood cuttings', and are just perfect for rooting. What makes this type of cutting so successfully is that large quantities of hormones reside in this new growth, as these urge the rose to produce more growth, more quickly, and luckily for us this includes rooting. It's important not to take cuttings that are too new (haven't yet produced flower buds) as this growth is too fragile and and can cause the cuttings to wilt before they produce new roots. Firstly, you can take cuttings from any type of rose, you just need to make sure that you select long, strong, healthy stems from this season's growth. Do not use cuttings from old wood as they are highly unlikely to take! Make the cuttings between 10 inches to a foot in length, cutting above a bud at the top to remove the shoot tip and below one at the base. Leave one leaf at the top and remove all the lower leaves. Although it isn't really necessary, dip the base of the cutting into a rooting hormone mixture. Next, insert several cuttings into a large pot of good quality compost such as John Innes 'Seed and Cutting'. Should you have it available you can add a further couple of handfuls of horticultural grit or perlite in order to improve the drainage yet further. However, go no further than a 3:1 ratio of compost to grit/perlite. Water the pot well then place it in a shaded spot and leave until the cuttings have rooted. Keep the compost moist. 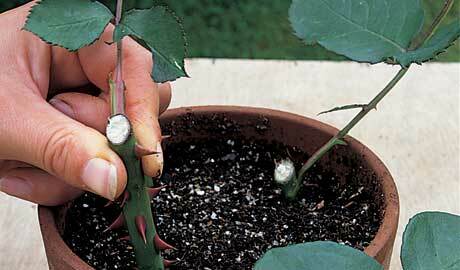 Pot up rose plants individually when well rooted which will probably be sometime next summer. 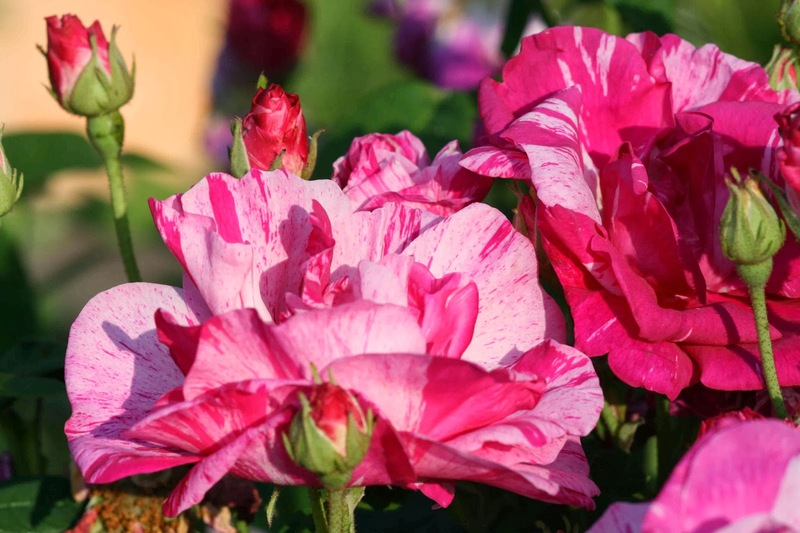 Alternatively you can take larger rose cuttings - around 18 inches to 2 ft in length, and plant them directly into a shaded propagation bed outside. Monty Don discusses this further in the above video. Of course, if at first you don't succeed, try again. 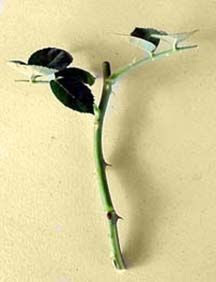 Many growers can have difficulty in growing roses from cuttings. While the success rate for rose cuttings can be low, you can improve your odds by planting several cuttings at a time, and by making sure that they are of a good thickness - something akin to a pencil.